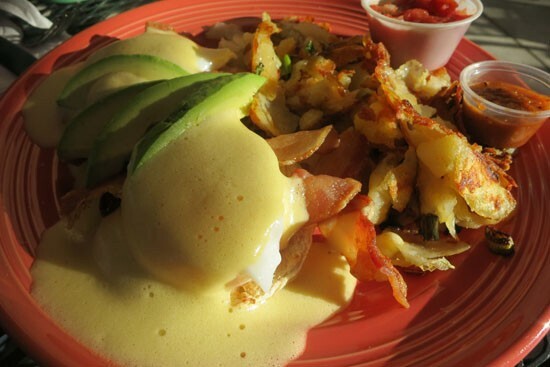 I have a theory that breakfast is a replacement for religion in Long Beach, which is really just my attempt to explain the hour-and-a-half waits outside of every egg-serving place in town on Sunday mornings. With so many devotees of the city's open-'til-2, breakfast-and-lunch cafés, then, it was surprising to discover that The Local Spot–a sister restaurant of Long Beach's well-loved Eggs Etc.–has been sitting relatively undiscovered in a Cal State-adjacent strip mall for nearly a year. Originally a lunch-only concept from the Eggs Etc. owner (who had her and her best friend's son serving burgers and grilled cheese sandwiches from an outdoor BBQ), The Local Spot eventually built a full-size kitchen inside and transplanted Etc. 's breakfast menu. Still, the word is only part way out about the city's latest house of worship and so it has become my new go-to for crowd-free eggy lunches. mushrooms, cheddar and Ranchero sauce). more of the breakfast options inside. Our waitress even offered some house-made salsas (the spicy salsa roja was best), which coupled with the soyrizo and sour cream on the omelette made for a great gabacha breakfast. 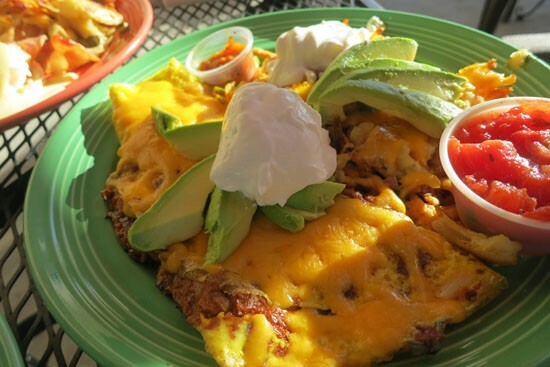 I know I'm probably shooting myself in the foot by ousting my favorite unknown breakfast spot, but if long Sunday wait times are the worst consequence of having this hidden gem be known, I will gladly share some loaded granola pancakes with the rest of Long Beach's faithful. 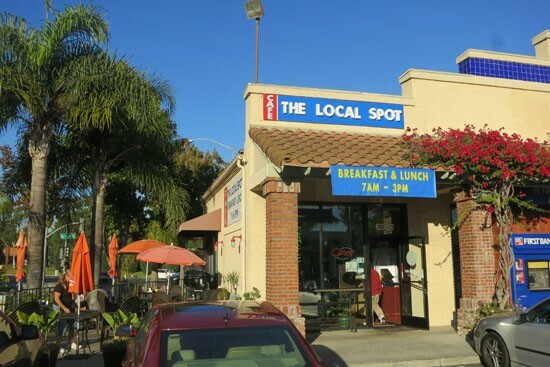 The Local Spot, 6200 E. Pacific Coast Highway, Long Beach, (562) 498-0400.